Learning a few conflict-solving strategies can help you to stay cool and defuse high tension situations. When it comes to conflict, it is easy to default to how we have reacted in the past. Bottom line: We approach problems similarly time after time. Of course in the heat of a conflict moment, emotions tend to run high, resulting in little time to think about how we really want to behave. Constructive conflict solving strategies take practice. Couples bicker an average of 2,455 times a year, or an average of 7 times per day. 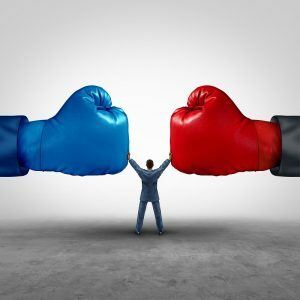 Professional conflicts in the workplace occur daily, and with the new political agenda, social conflicts are likely to enter our personal world with frequency. Reflecting on conflict-solving strategies and methods to remedy conflict with your desires in mind will better prepare you, and lead to better resolutions. Be vulnerable. While this may seem counter-intuitive to the way we normally approach conflict, it may produce the best results. Allowing the other party to fully understand your point of view is critical. Trust can much more easily develop when parties are completely open and honest with one another. Instead of trying to overpower the other party in a conflict, allow yourself to be vulnerable and open, which will hopefully facilitate a mutual respect, and in turn, a better solution for both parties. Be aware. Oftentimes in a conflict, our needs are our primary, if not our only concern. When we take a moment to check in on each party’s thoughts and feelings, we are able to more fully grasp all aspects of the conflict. Know each party’s interests and end goals. Once you are aware of what everyone wants out of the situation, do your best to incorporate this knowledge. When all solutions are taken into consideration, everyone can win in the conflict. Center Yourself. Seize a moment to take a deep breath and calm yourself before reacting in any conflict. This can help us think more clearly when approaching the problem. Asking friends and family for advice or suggestions is another great way to center yourself and gain perspective. Listen deeply and actively. Using empathic listening is very helpful in solving conflict. Take note of how the other party feels and expresses themselves, and do your best to “put yourself in their shoes.” While paying attention to the other party’s emotions, be careful to keep your own emotions in check and stick to the rules you have set in place. Acknowledge, respect, and thank. Repeat. Above all else, be respectful. When a conflict resolution does not end in our favor, it is easy to let our emotions get the best of us. However, respect that you and the other party have done the best you can to solve this problem appropriately, while taking into consideration the needs of everyone involved. Thank the other side for sitting down and resolving the problem with you instead of letting it turn into a heated argument. This entry was posted on Thursday, January 26th, 2017 at 3:47 pm. Both comments and pings are currently closed.